In 2006, a Demographic and Health Survey (DHS) collected data on school attendance in Nepal. A comparison with data from earlier DHS surveys, conducted in 1996 and 2001, shows a steady increase in primary school attendance over the last decade. The primary school net attendance rate (NAR) - the share of children of primary school age who attend primary school - has increased by almost 10 percentage points every five years, from 65 percent in 1996 to 84 percent in 2006. If Nepal can sustain this rate of increase it will reach the Millennium Development Goal of universal primary education by 2015. The increase in attendance was accompanied by a reduction in disparities between boys and girls, residents of urban and rural areas, and children from different household wealth quintiles (see the graph and table below). Much of the increase in primary school attendance is due to higher attendance rates in rural areas, especially over the period 2001 to 2005, when attendance in urban areas grew only marginally. Children from the poorest 20 percent of all households saw the biggest increase in primary school attendance, from 48 percent in 1996 to 77 percent 2006. The difference in the primary NAR between children from the richest and poorest household quintiles fell by more than half over the same period, from 42 percent in 1996 to 20 percent in 2006. Nepal also achieved a marked reduction in gender disparity over the past 10 years. In 1996, only 56 percent of all girls of primary school age attended primary school. This share grew to 82 percent by 2006. The primary NAR of boys grew from 74 percent to 86 percent over the same period. With a gender parity index (GPI) of 0.95 - the ratio of female to male NAR - Nepal has almost reached the Millennium Development Goal of gender parity in primary education. The authors of the final survey report from the 2006 DHS in Nepal counted children in school-based pre-primary centers as primary school students for the calculation of the primary school NAR. Children in informal, community based preschool classes were excluded from the calculation of the primary NAR. The author of this article chose the same approach. A UNESCO country profile of Nepal prepared for the Education for All Global Monitoring Report 2007 explains that "there are significant differences in the way the school based and the community based [early childhood development centres] are running. Most of the school based centres are run by the DEO [District Education Office], and most of them are more primary schools than development centres." The statement by UNESCO supports the treatment of children in school-based pre-primary centers in Nepal as equivalent to children in primary school for statistical purposes. In developing countries it is not uncommon to find children of primary school age in preschool but because of national differences the interpretation of the data from Nepal cannot necessarily be applied to other countries. Millennium Development Goal 3 calls for gender equality and the empowerment of women. One aspect of gender equality is literacy among men and women. In June 2007, the UNESCO Institute for Statistics (UIS) released new statistics on adult literacy and youth literacy. The adult literacy rate represents the population aged 15 years and older and the youth literacy rate the population aged 15 to 24 years. The most recent literacy data is from the year 2005. Figure 1 compares the male and female literacy rates in 135 countries. The male literacy rate is plotted along the horizontal axis and the female literacy rate along the vertical axis. For each country, up to two points are drawn, one for adult literacy and one for youth literacy. The location of a country relative to the 45 degree line indicates whether more men or women are literate. If the literacy rate of men and women is the same, the country's marker is located on the 45 degree line. 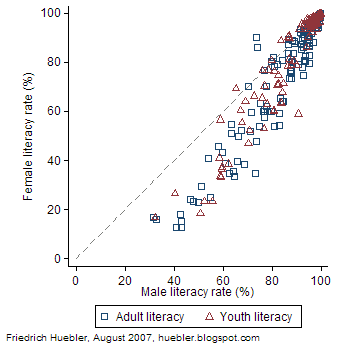 If the male literacy rate is higher than the female literacy rate, the marker is below the 45 degree line. In countries above the 45 degree line, a higher share of women is literate. Source: UNESCO Institute for Statistics, Data Centre, June 2007. The distribution of the points in Figure 1 shows clearly that in most countries the female literacy rate is below the male literacy rate. In Afghanistan, only 12.6 percent of all women over 15 years can read and write, compared to 43.1 percent of men. In Chad, the female literacy rate is 12.8 percent and the male literacy rate 40.8 percent. In four more countries, fewer than 20 percent of all women are literate: Niger (15.1 percent), Mali (15.9 percent), Burkina Faso (16.6 percent), and Guinea (18.1 percent). In 23 countries in total, less than half of the adult female population can read and write. Male literacy rates are generally at a higher level but 8 countries have male adult literacy rates below 50 percent. In addition to Afghanistan and Chad, these countries are: Burkina Faso (male literacy rate 31.4 percent), Mali (32.7 percent), Guinea (42.6 percent), Niger (42.9 percent), Sierra Leone (46.7 percent), and Benin (47.9 percent). Table 1 summarizes the literacy data from UNESCO. On average, the difference between male and female literacy rates is 12.8 percent among the adult population and 7.2 percent among the population aged 15 to 24 years. The smaller gender disparity among youth is due to trends in school attendance over the past years. Attendance has increased for both boys and girls but attendance rates have grown at a faster pace among girls. Source: UNESCO Institute for Statistics, Data Centre, June 2007. Average values are weighted by each country's adult and youth population. In spite of the movement towards gender equality, large gaps remain. In four countries, the gap between male and female literacy among the adult population is greater than 30 percent: Yemen (male literacy rate 73.1 percent, female 34.7 percent, difference 38.4 percent), Central African Republic (male 64.8, female 33.5, difference 32.3), Afghanistan (male 43.1, female 12.6, difference 30.5), and Togo (male 68.7, female 38.5, difference 30.2). In 18 more countries, the male-female gap is between 20 and 30 percent. These countries are, in descending order of the size of the gap: Mozambique (difference male-female literacy rate 29.9 percent), Pakistan, Angola, Chad, Niger, Nepal, Ethiopia, Democratic Republic of the Congo, Morocco, India, Benin, Guinea, Egypt, Sierra Leone, Cote d'Ivoire, Senegal, Malawi, and Cambodia (difference 20.6 percent). In a few countries, female literacy rates are above male literacy rates. In Lesotho, 90.3 percent of all women aged 15 years and older are literate, compared to 73.7 percent of all men (difference 16.6 percent). In Jamaica, the adult literacy rate is 85.9 percent among women and 74.1 percent among men (difference 11.8 percent). In four more countries, the literacy rate of women is between 3 and 1 percent above the male literacy rate: Malta, Philippines, Botswana, and Uruguay. The youth literacy rate among the female population is more than 1 percentage point above the male literacy rate in 16 countries (listed in descending order of the gap): Nicaragua, Liberia, Honduras, El Salvador, Botswana, Malta, Philippines, Swaziland, Qatar, Dominican Republic, Namibia, Brazil, Venezuela, Mauritius, Mongolia, and Sri Lanka. The difference between female and male youth literacy rates in this group of countries ranges from 5.2 percent in Nicaragua to 1.1 percent in Sri Lanka. In 15 countries, the male youth literacy rate is 20 or more percent above the female youth literacy rate. These countries are, in descending order of the literacy gap: Chad (difference male-female literacy rate 32.5 percent), Afghanistan, Yemen, Niger, Benin, Guinea, Ethiopia, Pakistan, Central African Republic, Mozambique, Sierra Leone, Angola, Nepal, Morocco, and Togo (difference 20.1 percent). To download the latest national literacy rates, please visit the UIS Data Centre. Years of schooling and literacy: Can everyone with primary education read and write?